In December 2017, President Trump signed into law the Tax Cuts and Jobs Act of 2017, the largest change to tax policy in decades. 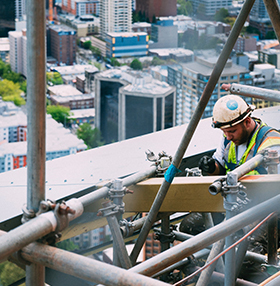 With most provisions going into effect in the coming year, it is important that construction industry leaders understand what has changed and how it will impact their companies. From the initial analysis done on the 2017 tax reform bill, the construction and real estate industries appear to significantly benefit from the new legislation. Several provisions will need to be closely examined, from the reduction in the corporate rate to pass-through entity tax relief. We recently sat down with firm partner Sarah Zimmerman to get her take on the new legislation. PropTech – Is 2017 the Year Things Change for the Property Industry?